I have lived about 11 or 12 years in New York, in two different times in my life. I lived there from the age of two and a half to nine and returned for graduate school in 1969. That’s not a large chunk of a life now over seventy years long, but both times marked me in significant ways and I add on a visit there whenever I can. Most recently, we decided to take a European vacation by going and coming back through New York. Planning in the comfortable environment of our living room, we anticipated the adventure of arriving at Newark airport, seeing a few wonderful sights and leaving from JFK, using only public transportation. For an Angeleno, this seemed already to be an adventure into alien territory. The Baltic cities might pale in comparison. Much as I feel at home in New York, the changes are always significant. For instance, gone are the tokens. As a graduate student I bought them in bulk, kept them easily and safely to hand in a pocket and negotiated buses and subways with ease. Metro cards are undoubtedly equally efficient, but we did not have sufficient information to use them properly. We had to queue up at the personal service window rather than use the machines. The besieged clerk listened to the rambling account of our travel needs, told us that our Social Security card could get us a discount, and then, with exasperated sighs and grumbles, waited as I searched for that card in the many pockets of my travel handbag where I secrete important stuff. Finally, in frustration and without waiting for me to actually show it to her, she rang up the discount, took our money, gave us the metro cards and dramatically shooed us away. I knew, of course, that New Yorkers expect you to know where you are going and to move quickly toward your destination. On the other hand, virtually every New Yorker will give you directions and advice. It’s not always graciously done–“Hey, Lady, you’re holding things up here; get out of the doorway.”–but it will always be accurate. New Yorkers freely admit when they don’t know the answer to your question, sometimes rolling their eyes to suggest that yours is the stupidist question they’ve ever heard, On that first day, we got help from four people, not all of it solicited. Returning from Europe several weeks later, we would need and get even more. Then there’s the weather. “Scattered showers and thunderstorms, some heavy” were predicted on that first day, but what’s a tourist to do? Out we went, fortified by a nice greasy breakfast. We made a pilgrimage to Ground Zero where construction still in-process had to be negotiated, then visited St. Paul’s chapel, adjacent to the disaster zone. It not only survived, but became a place of refuge for rescue workers. 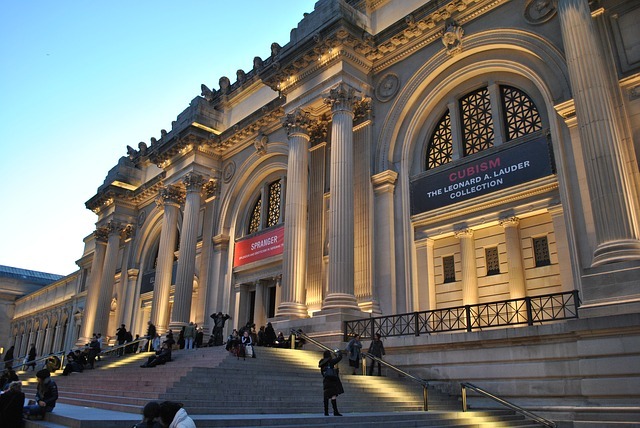 Then we headed uptown to the Metropolitan Museum of Art. When we had exhausted, not the Museum’s riches, but our energy to enjoy them, we decided it was time to return to the hotel with a coffee pick-me-up along the way. Going through the main hall, we noticed how the patrons were still crowding in, even at 4:00, and that they looked a little wet. But I had a hooded rain jacket and Bill, an umbrella, and we felt intrepid. We proved to be merely foolish. Before we had crossed Fifth Avenue, the skies opened up and the rain came down in sheets. We had to get to the subway stop at Lexington Ave and 85th street but by the time we got to Madison, my skirt–so pretty and gauzy in the morning–was drenched and slapping wetly against my bare legs with every step. At Lexington, we stopped under an apartment house awning, ignoring the glares of the uniformed footman, and took stock. It was impossible to get any wetter, but going four blocks more, even the short north/south blocks was daunting. Then we saw a bus, almost empty, go by on Lexington in the right direction, and we scurried over to wait for the next one under a store awning. We watched several of our buses go by without stopping, even though I ran to the curb and waved, wetly. Finally someone waiting for another bus, told us that the one we needed stopped two blocks further south on 79th. We ran down the two block, caught one, boarded and pulled out our metro cards. Now, there are four possible ways to insert a metro card into the meter. Both Bill and I managed to do it all three wrong ways before succeeding. The bus was air-conditioned and almost empty so cold air blew freely around, a condition we would have welcomed in the sticky morning, but not now that we were sopping wet. I refused to sit down. To that point, my underpants had somehow remained dry and I thought I’d be a bit more comfortable if they stayed that way. By the time we got to 60th street, the rain had stopped and we decided to get off at 47th and walk back down to 31st–the short blocks. At 31st and Madison, close to our hotel, we were just about dry. When I was a graduate student in New York, one sometimes, not too regularly, saw people who talked to themselves and exhibited funny twitches and tics. For the most part we gave them a wide berth although once, and I’m embarrassed to admit it, my friend and I imitated them. Patty and I had been at a concert downtown, after which we had gone over to Third Ave. to have a drink at P.J. Clarke’s. It was a treat we couldn’t often afford on grad students budgets, but we did love it. Once, splurging on a supper there, we were shown to our table by Rocky Graciano, who loved to hang out and play the gallant. So on that concert night, we were quite late returning to the Bronx and found ourselves in an almost empty subway station. There were a couple of guys we didn’t like the looks of and not a whole lot of other people. 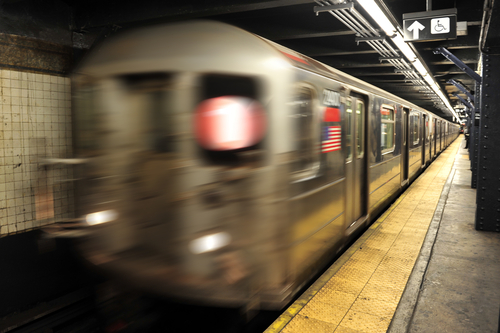 New York subway, The underground metro train system in Manhattan New York, USA. Patty and I looked at each other and she mouthed the words, “Act crazy.” Then she began to twitch. At the moment, it seemed safer than running and so I slowly moved a little away from her, started to rock back and forth and pull my head around to look over my right shoulder in a jerky movement. Then I started to hum as tunelessly as I could. The two guys quickly moved to the farthest possible end of the platform and we twitched and hummed and jerked until the train came. They got into a different car and we were able to drop the act. Only later did we wonder that it had been so easy to act crazy. That was then. This is now, I thought, as we entered the hotel. Now a lot more people talk to themselves on the street, twitch and wave their arms around. The cell phone era is in full swing. Coming home, we arrived at JFK after a ten hour flight from Zurich that followed a four hour flight from Moscow and a three hour layover in Zurich. I was wasted. And we had to get to Newark airport on public transportation. We departed the plane and got through passport control, luggage and customs without too much trouble. Then New York kindness really kicked in and OK, I know that now it is largely triggered by my gray hair, but still . . . . As I went toward the information kiosk, I was intercepted by a large woman in a bright red blazer. “May I help you, darling?” she asked in a voice whose Caribbean cadence lifted my spirits immediately. She told me how to find the air train in great detail, where to find both an elevator and escalator, what stop to get off at. “If you forget any of this, darling,” she concluded, “just find another red jacket.” I started forward with a brisk confidence I hadn’t felt since we left Moscow. We boarded the air train that filled up quickly and a young woman got up and insisted that I take her seat. Shortly after that, an even younger woman next to me stood up and insisted that the first courteous woman take her seat in turn. Laughing ruefully and muttering something about feeling old, she complied and we chatted for a few moments, sharing our mixed feelings about such mixed blessings. Then the man on the other side of me started a conversation with, of all things, something resembling a “come on” line. “Are you with him,” he asked me smiling, and nodded at my husband who was standing in front of me and holding on to the pole. When I said yes, he responded, “I’m sorry.” To which I responded, “I’m not,” still smiling as broadly as fatigue allowed. His opening gambit may have had something to do with the fact that Bill was wearing a black Russian fur (well, fake fur) hat on the 11th of June with the outside temperature at 78 degrees and muggy. It hadn’t fit into our luggage. We got off the air train, were directed to the LIRR by a shuttle driver who told us where to buy a ticket in advance (cheaper that way) and where the elevator was. Two women helped us get off the elevator at the right level and the LIRR conductor, noting our luggage, made sure we got into the right car for the airport, knew the right stop and where to get the airport shuttle. Finally settled in the airport lounge, I felt that I had been personally escorted from one airport to another by some mysterious, anonymous friend, acting not in her own person, but through a series of individuals who were linked together and operating on instructions. I’ve been in and out of many airports, foreign and domestic, and made use of lots of public transportation. All I can say is, you gotta love New Yorkers. What fun for me to have discovered this site and your essay on traveling through NY. And what fun to have met you when you lived in NY. . . Good cheer and happy travels.